Awards 2014: Best speakers revealed | What Hi-Fi? Introducing our nine favourite sets of speakers this year, with prices ranging from £200 to £2500. Our Award-winning speakers include products from B&W, Wharfedale, PMC and Q Acoustics. 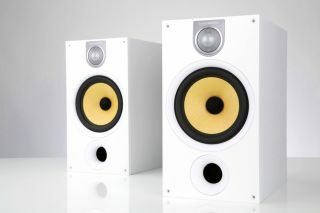 Our Product of the Year title goes to the brilliant, £500 B&W 685 S2 speakers. They're a thorough revision of a long running favourite, and have been improved in just about every sonic area. These standmounters aren't just good enough to beat similarly-priced rivals, they have the talent to make life difficult for capable products in the next price class up too. KEF's highly-regarded LS50s are a casualty, losing out on a gong because we felt they didn't quite offer enough over the B&Ws to justify their £300 price premium. Our new favourite budget speakers are Wharfedale's Diamond 220s. These are an update of the talented 121s, featuring a better finish (it was needed), as well as improved sound. The Diamond 220s had to fight off last year's winner, the Q Acoustics 2020is for top spot. The Wharfedale's greater transparency and dynamic expression helped it win out. Move up in price and Q Acoustics hit back with the Concept 20s. We've been huge fans of these speakers since we first heard them last year, and nothing we've come across subsequently has changed that opinion. If you have £350 to spend on standmounters go for these. We've also got a soft spot for the similarly-priced Dali Zensor 3s. These chunky standmounts offer more in the way of enthusiasm, but lack a little refinement and precision in exchange. If you have a bigger room, or just fancy a whole lot more bass, Q Acoustics provide the answer in the form of the 2050i speakers. For £460 you get beautifully made floorstanders that have the ability to fill your room with a sound of impressive scale and authority. And there were more Best Buy Awards for speakers from ATC, B&W, PMC and Ruark Audio. To see them all head over to the Best Speakers 2014 category on our dedicated Awards 2014 microsite.